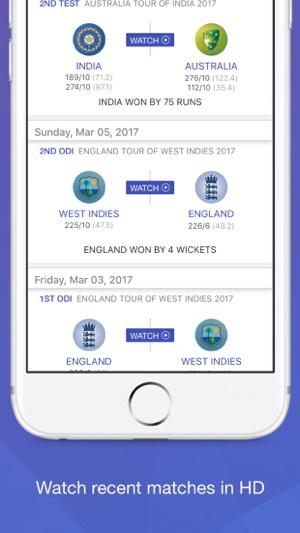 The best Cricket app for Live Streaming, Live Scorecard, Live Commentary, Highlights & Replays. Watch all the catch up action from interactive live scorecard & live commentary. Missed the Live match? 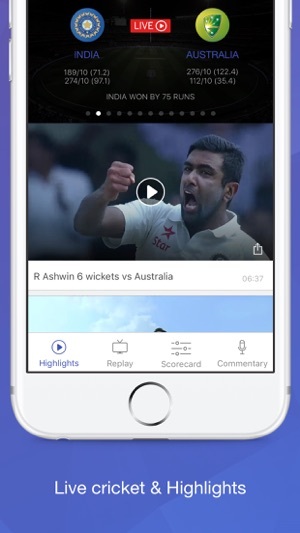 Watch entire match replay on your favorite device. 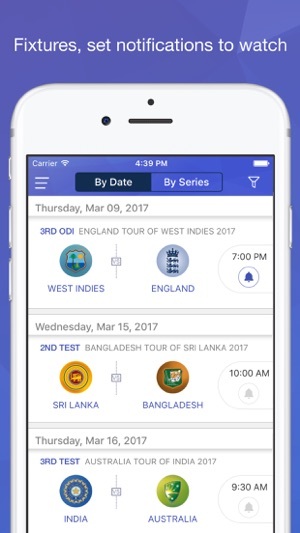 Willow, the premier broadcaster of cricket in the United States and Canada brings all the exclusive LIVE & On Demand action of the cricket to your iOS devices. 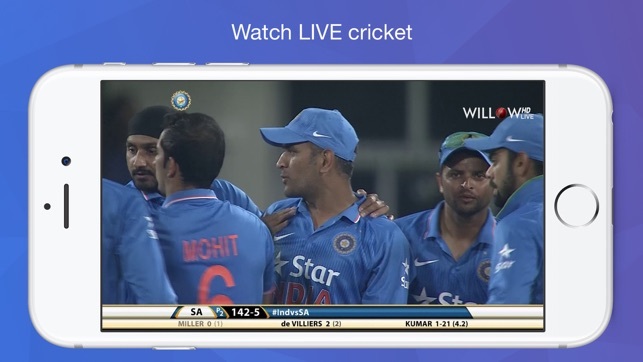 - Willow Premium Subscription is required to watch live streaming of Cricket. - Follow us on Twitter for the latest updates and to provide feedback on the app: twitter.com/willowtv. 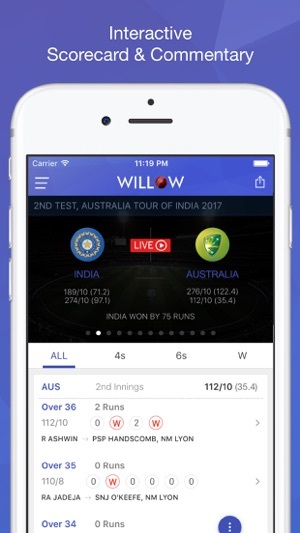 - Use the Feedback form in the app’s Settings menu to let us know how we are doing..
Willow tv always takes our precious time away from us for their business collaborations, I mean we have to do the hard work entering our login ID and passwords to follow the process to watch Ipl or any other series. Why can’t willow tv provides customer a seemless service regardless of their collaborations. I really hate to go through the process to setting up again for this we pay a premium membership price. Please take a leaf out of Netflix’s customer service and the way they handle their content sharing, collaborations with various production companies and effective policies in implementing its business model seamlessly without disturbing the customers. Please don’t redirect to another website next time in order to watch cricket , work with the new company and make sure willow tv subscribers will get to watch without any links or layers of process. We don’t Have time to babysit your team. 1. Do not ever logout of the app, like ever. If you do for some reason, then god help you. It asks for a subscription, even though if you have an active one. 2. They say, they would provide credentials for Hotstar to watch content like Ipl, Upcoming World cup. First of all, this is horrible and their instructions do not work to get the hotstar credentials. It never did for me. 3. For Christ sakes, willow does not even have a customer care phone number to reach out to. All they have is email support, which is crap. I’ve reached out plenty of times only to receive a response after 2-3 days, asking me to try the same old things which I’ve told I tried already in my emails. 4. I do not recommend this to anyone. You are better off with Hotstar. I’ve asked them to refund my money which I know will not happen, to which they replied contact Apple, since you’ve used itunes for subscription. This is LOL!!! I’ve cancelled the subscription and moved on to Hotstar. Way way betterr!!! Get a coupon on slickdeals, get the one year subscription on hotstar. Much better, not like this crappy service. Please don’t subscribe to willow tv. Their support team is worst. I am having issues with login to my roku app with google auto sign in. Apparently they never told that it’s not supported for tv login but allowed for account creation with google auto sign on. When I contacted their support twice chat agent disconnected me in between. She/he had no idea what I was talking about. Sent mail to customer service and got response after two days. Response was also generic one asking me to login with user id password . They apparently donot understand the auto sign in feature use. Tough time contacting support team who don’t understand anything. I would suggest don’t fall into this scam. They are scammers who don’t care if you loose your money. Better look for alternatives.